Thanks to Fred Hébert and No Starch Press I had the chance to get a review copy of “Learn You Some Erlang for Great Good!” so I guess that somehow it is my duty to write in this Erlang blog my opinion about it. When I started with Erlang some years ago it was not easy. I am a huge Erlang fan (I guess you noticed that) but for a guy coming from Java and C++ with no knowledge at all about functional programming, the beginning was not trivial. After reading a couple of good books (some of them are on the right panel of this page) I felt better: my Erlang coding improved but I still felt that something was missing…then I found *it*. 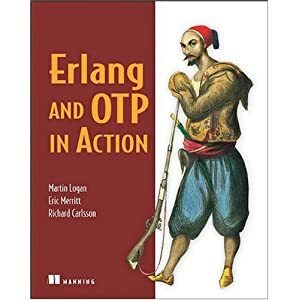 I remember the first time I landed to “Learn You Some Erlang”: I was desperate with some strange behaviour with supervisors and asking online I got a really good answer that pointed me to a new free online book about Erlang, so I gave it a try and clicked the link. I must admit that at the beginning I expected a totally different book…I mean, most of the free books you find online are usually incomplete and boring, so I guess you can understand how I felt when I saw the magnificent work Fred did. For me, it was such a pleasure to read his work about supervisors that I switched back to the introduction and read in a few hours all the previous chapters…if you had the chance to get through Fred’s work you know what I am saying: the book is technical (of course! ), but in it you can find not only the usual explanation of the language, you can find much more! The book contains a bunch of useful real life examples, a lot of theory that can be applied to any distributed systems and a thousand funny pictures that make me smile and enjoy the reading even more. You may think that since the book is available for free online (and for this I guess we should thank No Starch Press) there is no reason to buy the solid book for $49.95: well, you couldn’t be more wrong about it. I can’t describe what I felt opening the envelope and turning page after page looking for my favourite parts of the book….it just felt good, like meeting an old friend I haven’t seen for a while. The book layout has slightly changed and a set of small arrangement have been done to Fred’s book, so the visual impact is even better and the reading is actually easier. light enough and you can keep it easily in one hand. Some random guy over there could say the images in the book are in grey level and not coloured as in the online version. They could also say that nowadays books are prehistory (I don’t agree) and that almost every developer has a tablet; the latter could be true but you should know that the book comes with a free Ebook version (with the solid book) that has colours, so if you want you can have it in your PC, tablet of smartphone. Now, about the contents of the book there is much to say! In its first chapters Fred helps you with the first steps in the Erlang world as for example its syntax and the basic principles of functional development. Further in the book, more interesting topics are covered, here you will learn about Erlang concurrency easyness and you will start understand why Erlang is so good for distributed and fault tolerant systems. But Fred’s work is not only for Erlang beginners: diving more into the book you will see that that are a lot of topics which are interesting also for experienced Erlang programmers as Releases, Common Tests and Distributed OTP Applications. I guess I made myself clear within this posts: “Learn You Some Erlang” is a must-read-book every developer out there should add to his Erlang shelf. I recommend it without any doubt and I take this post as good chance to thank Fred Hébert once more for his great job and for the help he gave me without even knowing. I would also like to thank Fred and No Starch press for giving me the chance to review this amazing book. So what are you waiting? Click here and buy your own “Learn You Some Erlang for Great Good” copy!